Josué Eleazar Castro (pronounced hoe-sway) may not represent the stereotypical image of a fictional Geppetto toy maker but at 23 years of age he represents a new generation of Mexican toy artists. As a mechanical engineering student, he is gifted with an ability to create magical mechanical folk art (automata) that comes to life with the turn of your hand. Like a magician, Josué’s masterpieces create a sense of wonder and bring a smile to your face. The work appears deceptively simple, but each has great detail and engineering to make these mechanical marvels come to life. Much like Geppetto’s famed Pinocchio – each one of these creations seems to have its own sense of mischievous attitude and they also have a tendency to run out the door to the delight of collectors. All are handmade using recycled materials of cardboard and paper mache. These are not made for children and toy safety standards, but they will still delight your inner child. Josue’s work is gaining traction in Mexico and he has been recognized with regional and national awards. Josué studied with Mexican paper mache artist and teacher Osvaldo Ruelas Ramirez. 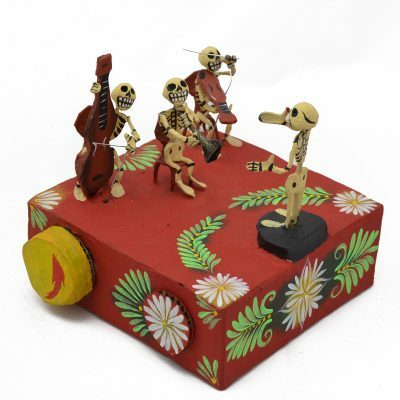 Osvaldo is dedicated to the continuation of this art form and has created a bright path forward for Josué and the future of Mexican folk art. We hope his work touches you the way it has already touched so many. There is indeed magic in these feel good creations. It makes us proud to encourage emerging artists like Josué. We are his first major supplier in the USA and can’t wait to see his creativity evolve.